Marius Watz, Paul Bommer, info, dogs in cars & vanity Tweet publishing. Here are a few links that caught our attention over the past few weeks. Paul Bommer’s faux tiles from his recent show. Easel.ly (currently in beta) aims to make attractive infographics online. A new form of ‘vanity publishing’ – Tweetghetto is a slightly mad Italian project to turn Tweets into posters (below). Above: Tweet-encrusted poster sent to Eye by Better Nouveau. Marius Watz’s work on the world’s longest façade (350m) at the Taman Anggrek complex in Jakarta (thanks to Golan Levin for this link). 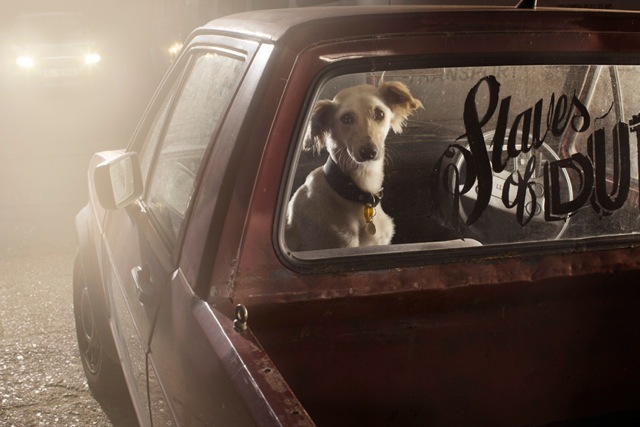 Photographer Martin Usborne has a Kickstarter project to make a photobook of Dogs in Cars (below). See Martin’s article, ‘Who (didn’t) let the dogs out’ on the Eye blog in October 2010.